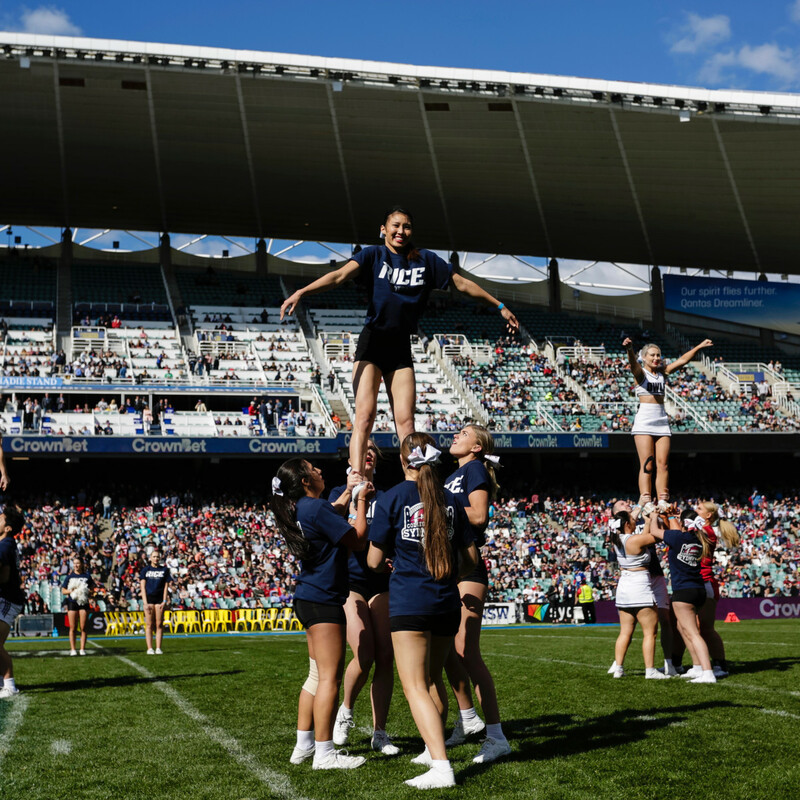 The Rice Owls lost their season opener to Stanford 62 -7, which was the second straight stomping at the Sydney Cup College Classic. California crushed Hawaii 51-31 at last year’s inaugural event. 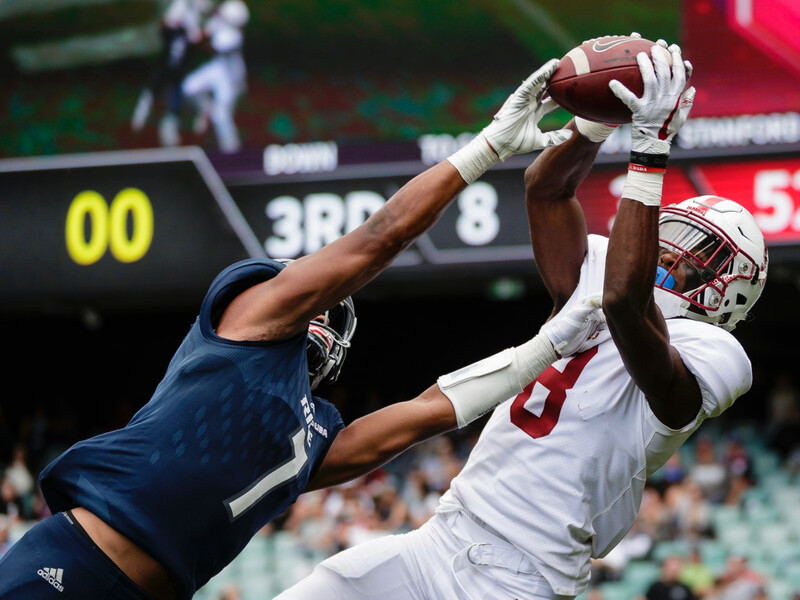 Sunday afternoon’s game (local time in Sydney, though the game was broadcast live on ESPN in Texas at 9 pm CST on Saturday) was a rematch between the two teams at Stanford last November where the Cardinal came out on top 41-17. 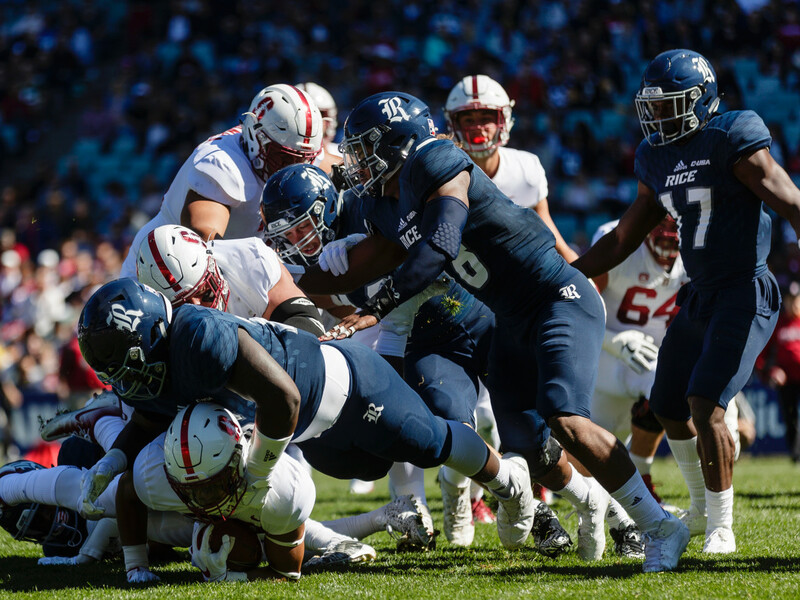 Stanford again dominated the Owls in all categories, with 656 total yards of offense compared to Rice’s 241 yards and two turnovers. 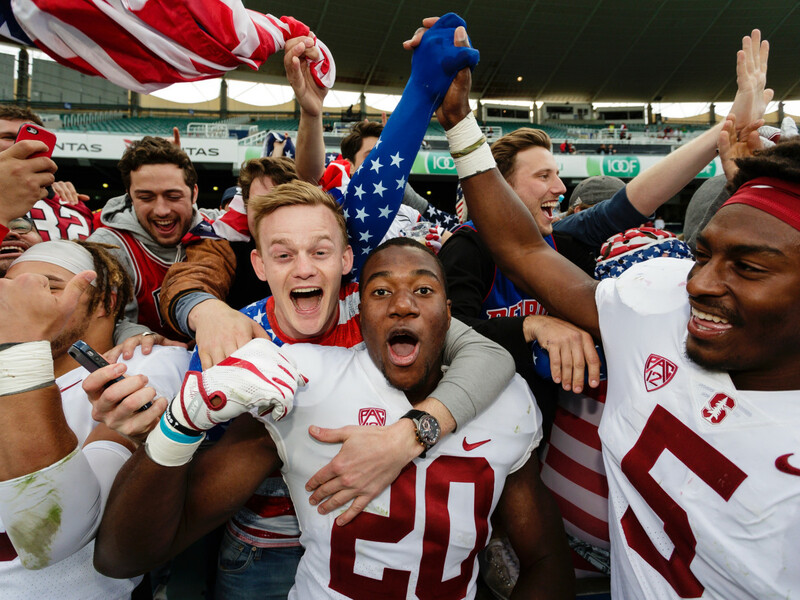 If you are wondering whether Allianz Stadium had more Rice or Stanford fans in attendance for college football’s opening game in Sydney, the correct answer would be: the NFL. Fans everywhere donned their favorite American football jerseys, claiming allegiances ranging from Dallas to Oakland to Green Bay and the rest of the league. Given the Stanford football program's success over recent years, there were definitely more Cardinal supporters in attendance, some decked out in head-to-toe "Fear the Tree" gear, but all just wanting to catch a glimpse of American football and the tailgating scene. 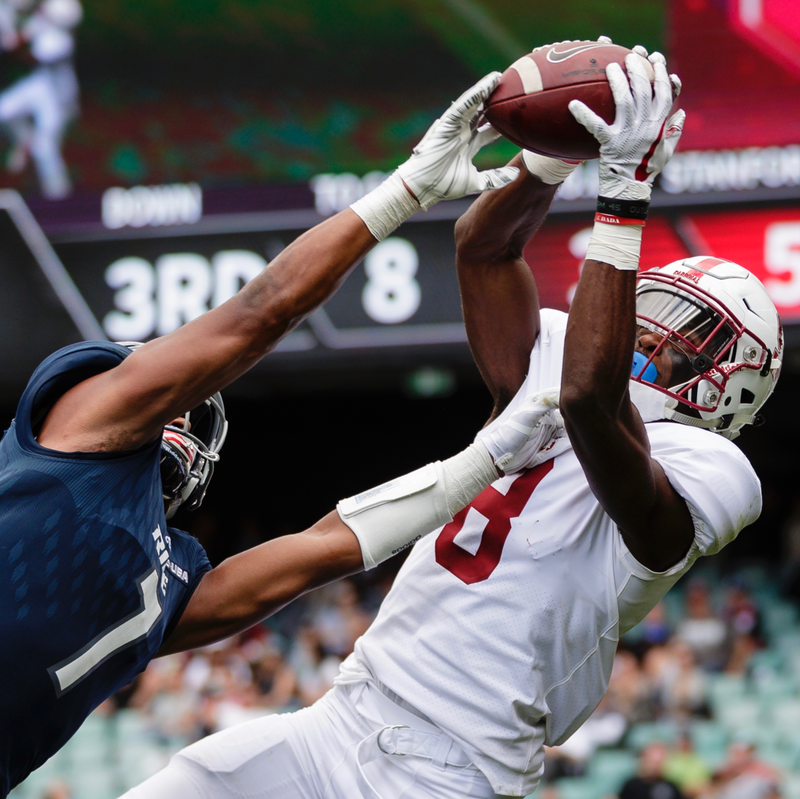 Fans were treated to an ill-timed and oft-occurring cannon, which signaled every scoring drive, almost always signaling another score for Stanford. After the first half, most of the 33,181 fans grabbed a spot near one of the TVs broadcasting the highly-touted Mayweather/MacGregor pay-per-view fight. 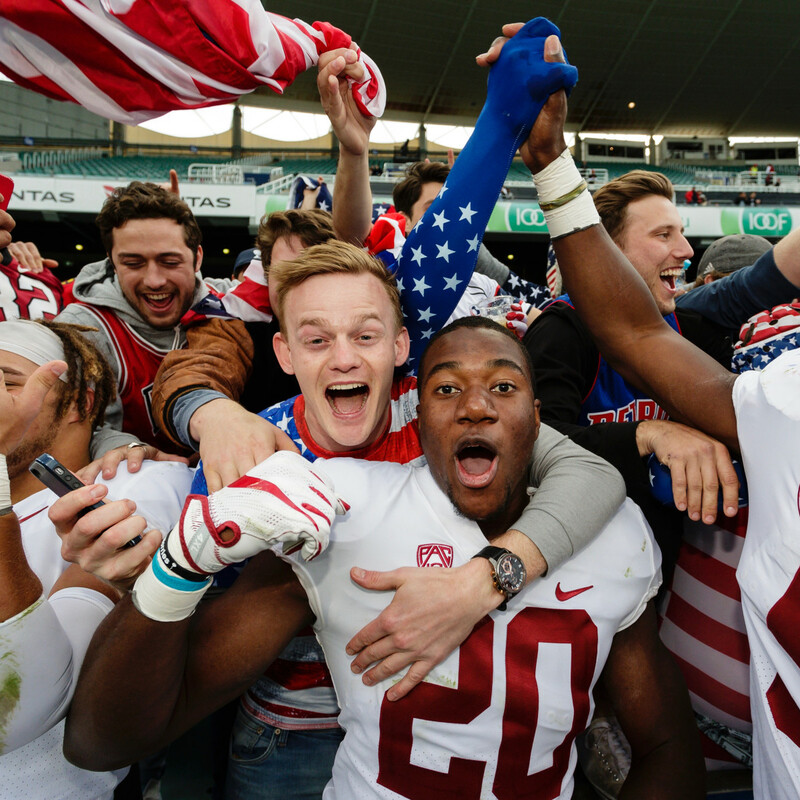 Fans could still hear the cannons just behind the TVs, as Stanford continued to run up the score while Mayweather neared his final victory inside the ring. Many fans in Sydney said they hope the game will be an annual tradition. "Any chance to see American football is worth it," one stadium passerby said. Other fans took the opportunity to explain American football rules to friends and family. "The team has four tackles to make it to that marker," a fan explained to his girlfriend as he pointed towards the first-down placard. 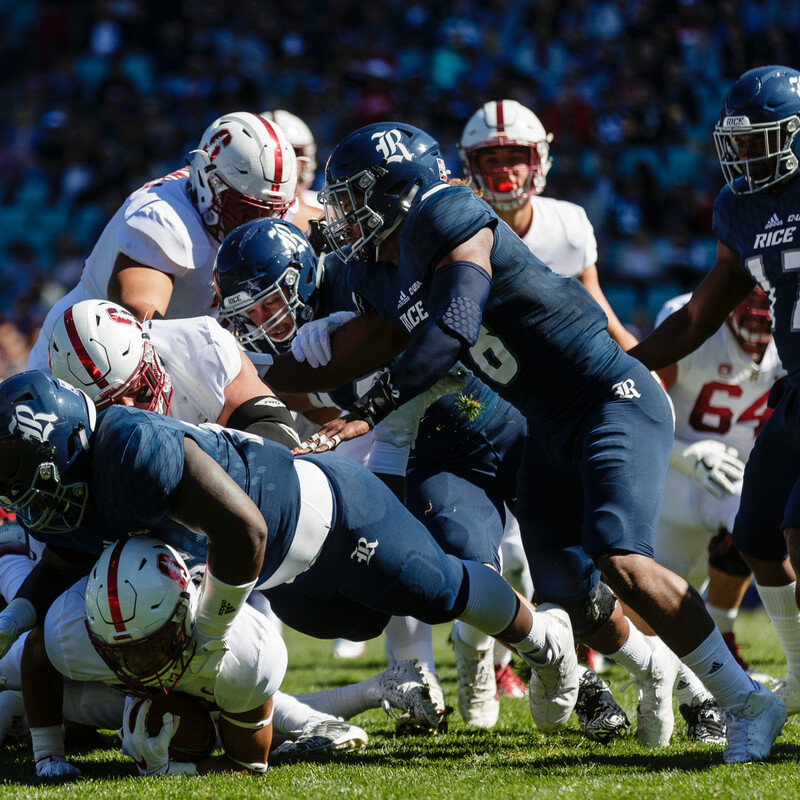 Stanford continued to dominate Rice the entire game, but the Owls avoided the dreaded shutout thanks to Austin Walter’s lone 23-yard touchdown run late in the fourth quarter. Lopsided game aside, fans who traveled nearly 16 hours and across continents for the game left happy and thankful for the experience abroad. Dallas resident Kim Whitaker, mom to Rice running back Collin Whitaker, explained this it was the redshirt freshman's first time traveling with the team. 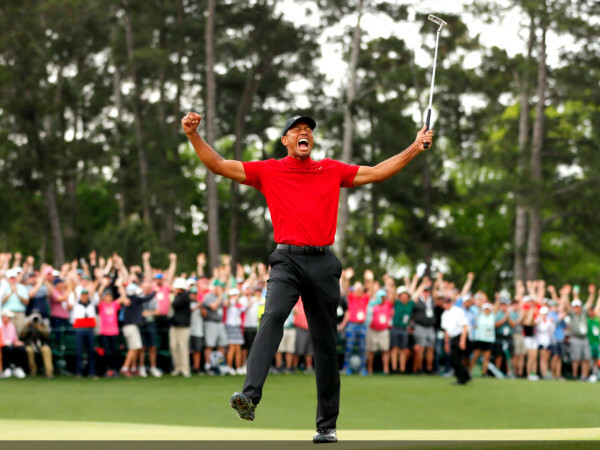 “This has been an incredible opportunity for him to learn a different culture and get a chance to see other people be excited about American football. He kind of feels like a celebrity as the folks here in Sydney are pretty excited about American football," she said. "The coolest experience I’ve had so far was visiting the Blue Mountains, which were beautifully majestic. It was so incredible to see the valley and incredible display of nature. The city of Sydney has been fantastic – they’ve been incredibly welcoming,” she explained, having traveled all the way to Australia with about 55 other parents from all over Texas. Dian Walter, Houston resident and mom to Rice twin brothers Aston and Austin Walter (both juniors), travels to all the games, but Sydney is by far the furthest she’s traveled to see her sons play. “It’s been a great experience being able to explore the city and meet some of the locals and to be here with my sons. It’s amazing to be here with my sons considering we have a hurricane in Houston. 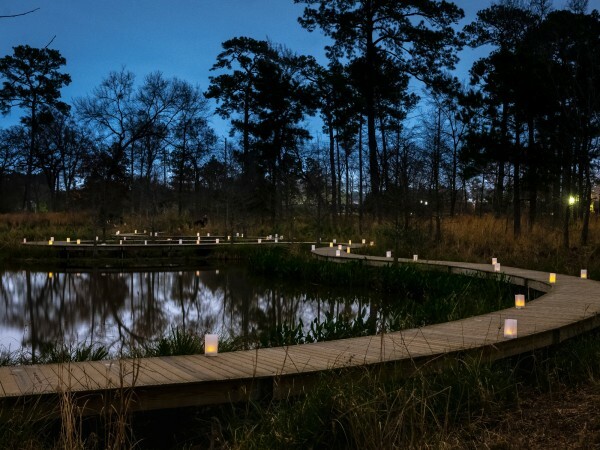 To be here together, that gives me peace knowing we are together,” she said. 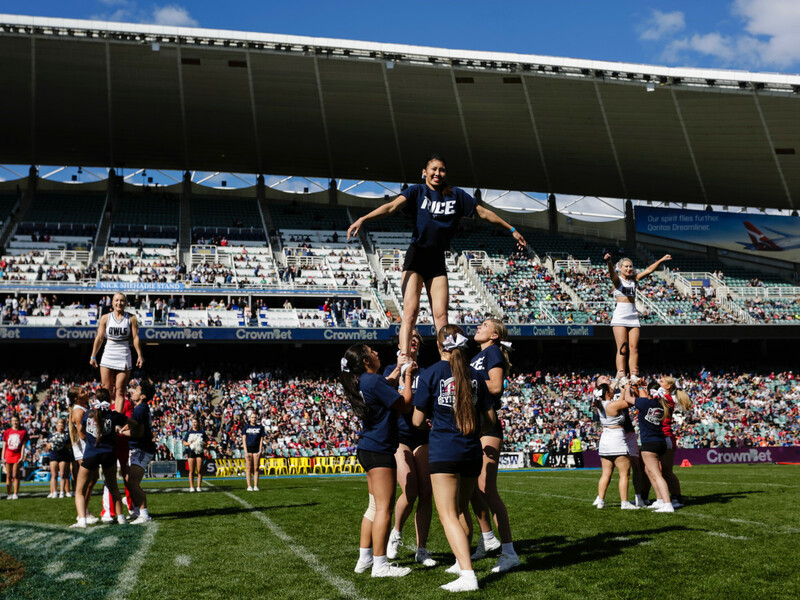 Although the outcome wasn't what Rice fans had hoped for, they were still treated to a beautiful and iconic destination and all can say they were part of the university's first international football game. “There’s going to be some great memories here,” Rice head coach David Bailiff said about the team’s overall experience in Sydney. “It’s not just seeing things like the Sydney Opera House, it’s watching their (the players') faces light up when you see them interacting together and pointing things out,” Bailiff said. 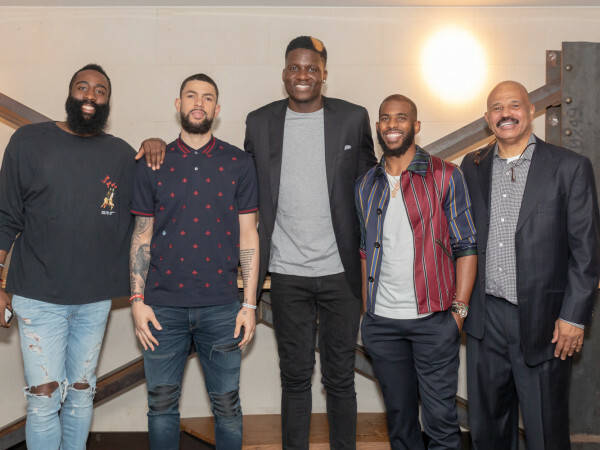 The team concluded the press conference by letting everyone in Houston know their thoughts and prayers were with them as they were dealing with the devastation from Hurricane Harvey. Now they are headed to Houston, although it's unclear how long it will take the team to get home. Next up for Rice Football: UTEP in El Paso, followed by a Houston showdown against the University of Houston Cougars. No passport required.